Despite the reading material, I was preparing for a long morning. But nothing could be further from the truth! While the students were sweating and battling their way through the exam, I picked up a paper about the history of electrical stimulation . It was discussing about the very first steps of electricity for medical applications. 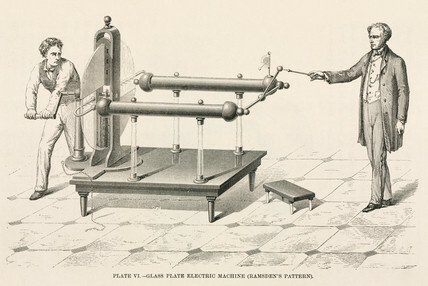 As it turns out, soon after the development of the first electrical devices in the second half of the 18th century (such as static electricity machines, the Leyden jar or later the volta-cell), these devices were put in use for medical research very soon. Just like myself today, people were fascinated by how our body responds to electricity. Besides experiments, the inguinity of researchers to build machines is very remarkable. Without the availability of vacuum tubes (let alone transistors), it is hard to make pulses with accurate duration in the order to hundred milliseconds (which are required for stimulation). Various mechanical systems are described, of which the most remarkable one is a system in which a gun is fired to cut two wires placed at a certain distance from each other. Only during the time the bullet is travelling from the first wire to the second, the system is injecting electrical energy into the tissue. Imagine how being a researcher was like in those days: shooting rifles the whole day! Quite a difference from running circuit simulations like we do today! For more interesting stories I can highly recommend to read this paper. Or save it for when you have to supervise an exam. For now: time to check the exam! This entry was posted in education, general, neurostimulation, pacemakers. Bookmark the permalink.